1. Domain Z of protein A, which is the part recognizing and binding to the antibody on the cancer cells. 2. 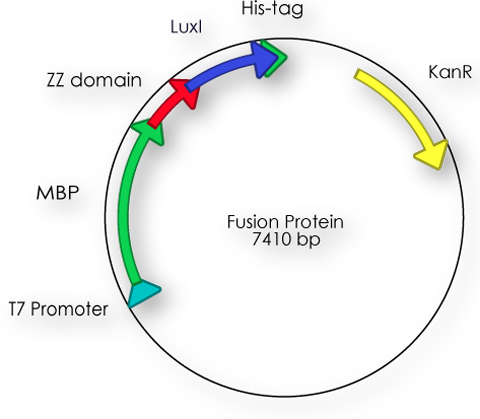 LuxI; which induces the conversion of SAM to HHL, which is eventually responsible for the expression of GFP in E Coli. Most of the to date identified quorum sensing systems are based on N-acyl-l-homoserine lactones (AHLs) and were first described in Vibrio fischeri. This mechanism is based on the formation of AHLs from SAM by the enzyme LuxI. Consequently the produced AHLs can activate the transcriptional regulator LuxR thereby activating the lux operon. The activation cascade results in the production of luminiscent signals in nature. For SensorBricks LuxI as part of the fusion construct will also be used to produce AHLs which will activate different reporter systems within the detector E.coli in form of fluorescence. Protein A is a transmembrane protein present in the bacterial species Staphylococcus aureus. It is bound to the cell membrane via its C-terminus and can bind the Fc regions of immunoglobulins with its N-terminal domains, E, D, A, B, and C. A synthetic homologue to domain B, called domain Z, has been developed and successfully used for structural analysis and protein purification. A double Z domain, ZZ, is used in the SensorBrick fusion protein to allow for binding to cancer cells marked with anti-CD33. For the design of the Fusion protein a plasmid provided by the MPI-CBG, namely pETMM43, was used as it contains both a Maltose-Binding-Protein (MBP) and a His-tag for purification. A second plasmid, pETMM11ZZ, served as template for the IgG binding domain Z. It was found that the IgG binding sites are mainly located at the N-terminal end of protein A. Furthermore IgG binding efficiency is enhanced when several copies of domain Z from protein A are present. 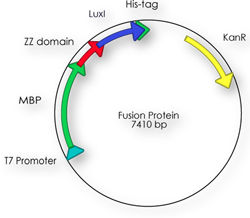 Therefore the fusion construct was designed to habour the double domain called ZZ and luxI at the C-terminus. Primers were designed to introduce the restriction sites required for assembly. At the 5’ end of ZZ double domain (Fusion partner 1), a BamHI site was introduced compatible with the plasmids site. At the 3’ end of double domain ZZ a AgeI site was added which is compatible with NgoMIV site at the 5’ end of the luxI resulting in a novel site. To insert luxI at the 3’ end, an EcoRI site was placed for insertion into pETMM43 plasmid. This approach could also be used to modularly assemble different combinations of fusion constructs. For constructs with two proteins inside the plasmid pETMM43 we decided to use the maltose binding protein (MBP) for purification as it is known to increase the solubility of the proteins to be purified. Additionally experts for MBP purification were available in house. After the first purification step MBP can be cleaved and a second purification step using the C-terminal His-tag can be carried out.